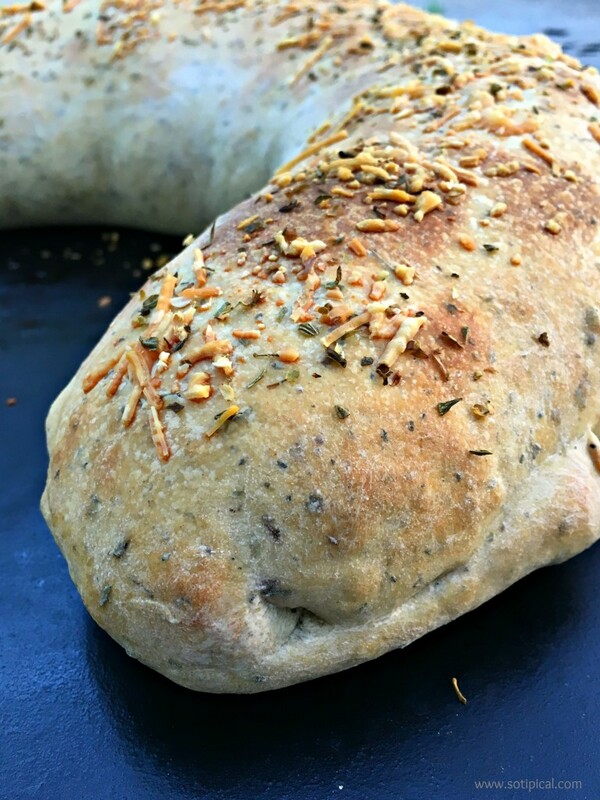 My grandmother’s stuffed spinach bread recipe has been a favorite in our family for the last 60+ years! We have all learned to make it as teenagers and some of us have added our own twist to her original recipe. She made her own dough, but I purchase pre-made pizza dough. We eat it as an appetizer, a snack, and very often with a salad for lunch or a light supper. Just last week I made one for the kids as an after school snack and look what happened after just FIVE minutes! This was all that was left! Well, at least I got the last piece! Allow dough to sit out for about 20-30 minutes prior to rolling(this was according to the directions on the package). I used the Garlic Herb Pizza Dough from Trader Joe’s. It is a great value at under $1.50! 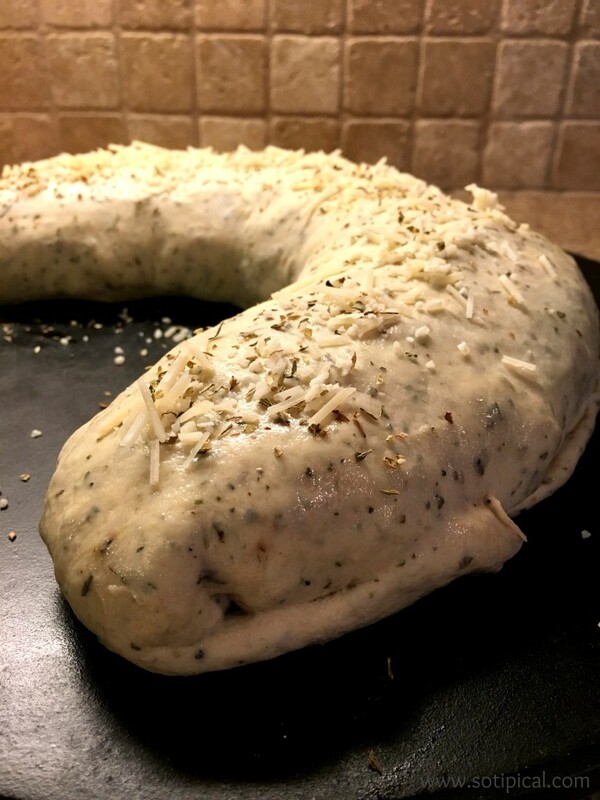 We usually add fresh garlic to this recipe, but since I was using a garlic herb dough, I opted to leave it out this time. 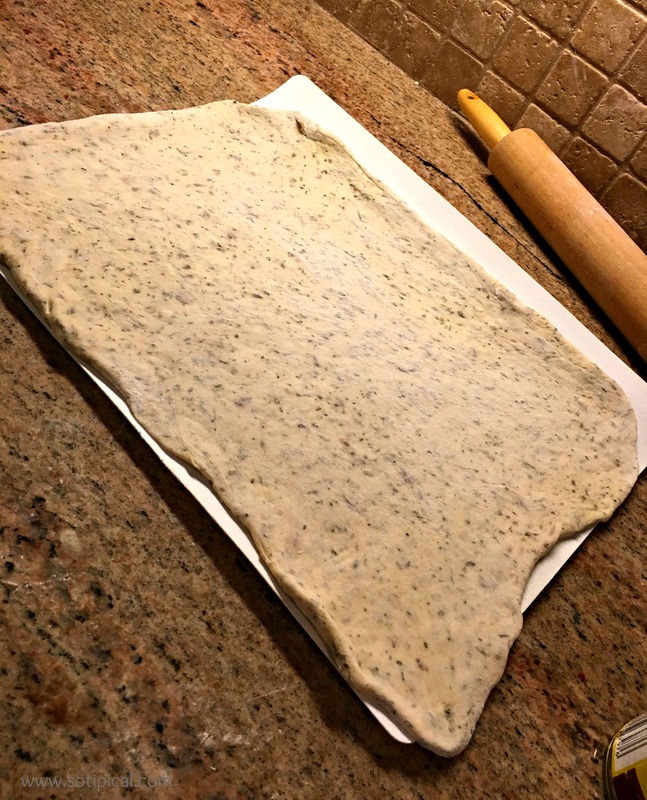 Lightly flour your surface and roll dough into a large rectangle. 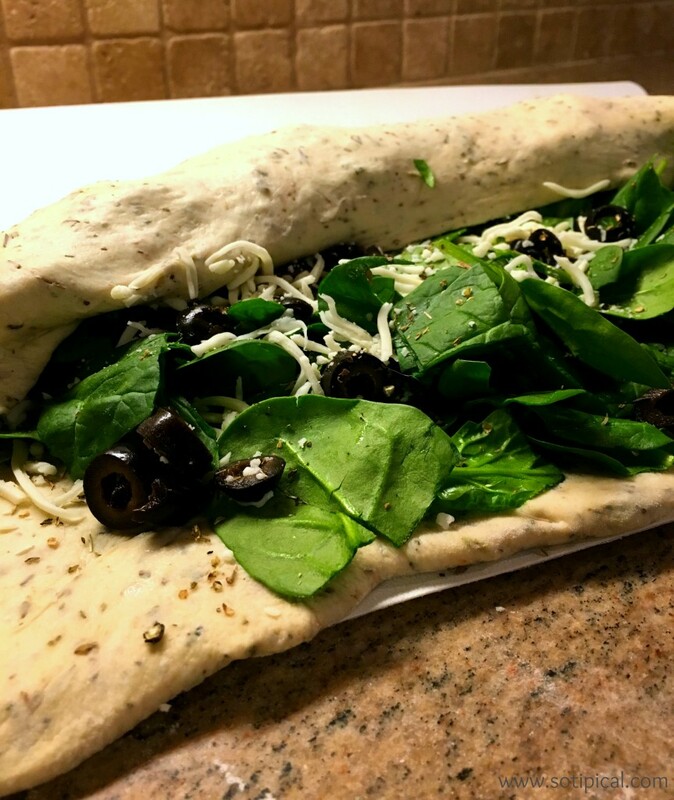 Lightly brush with a little extra virgin olive oil, then top with the chopped spinach. Then add the olives, mozzarella cheese, oregano, salt & pepper. 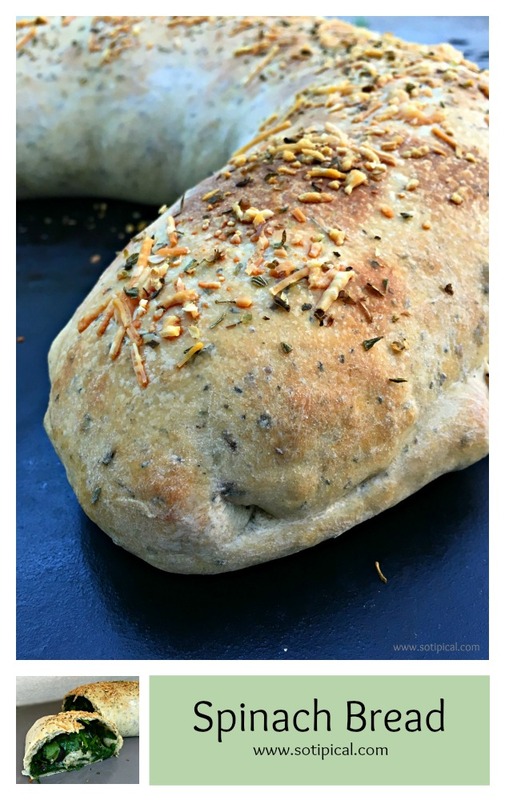 Carefully roll the dough and be sure to seal the seam and the ends. Arrange on a baking stone. If you use a sheet pan, you’ll want to grease it or use parchment paper. Brush some remaining extra virgin olive oil over the top. (If you prefer, you can brush with egg for a shiny crust. I actually ran out of eggs so I used the EVOO instead.) Top with parmesan and a pinch of oregano, if desired. 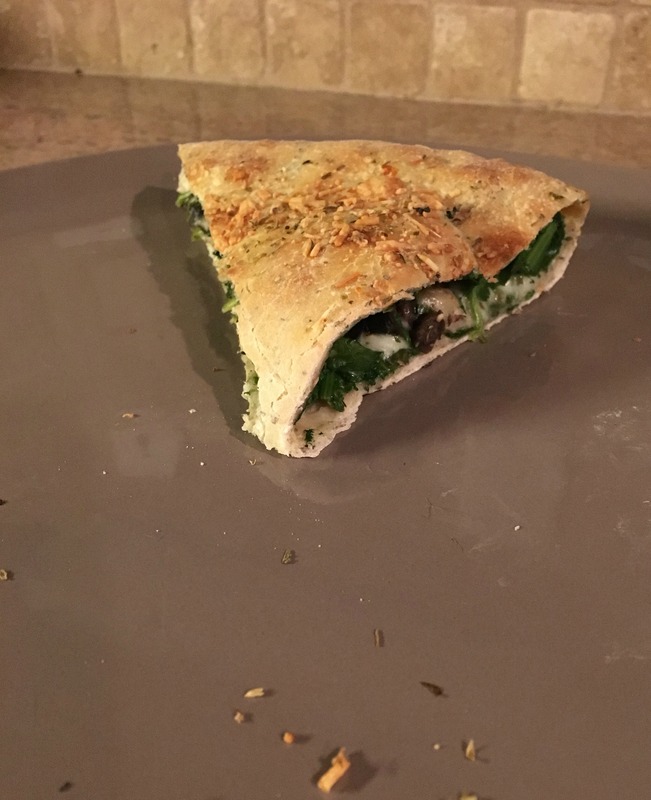 It had a nice crunchy crust. I find that when I brush the bread with egg, it tends to be a little softer in consistency. 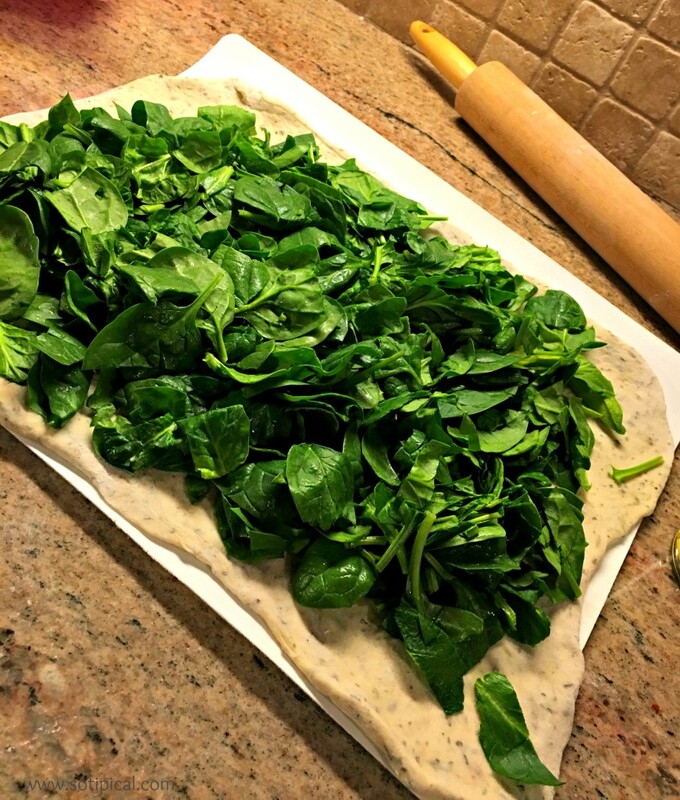 * If you choose to use frozen spinach, be sure to squeeze the excess liquid very well so your bread doesn’t end up soggy. The same thing can happen if you cook the spinach first, so make sure you just barely wilt the spinach. Do not cook too much or it will release too much liquid. You can add more or less cheese if you like. We often add crushed garlic, sautéed onions, green onions, sautéed peppers or mushrooms. The possibilities are endless! And there you have it! A great option for Meatless Mondays! 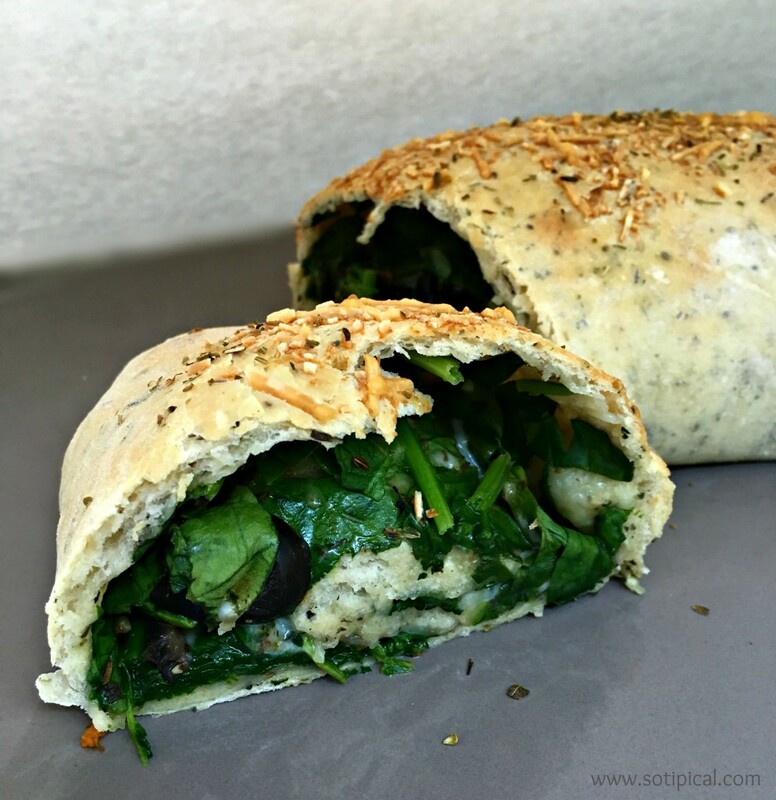 What would you add to this yummy stuffed spinach bread? Let me know in the comments!